Many visitors to Louisiana might not know the difference between Creole and Cajun food. Creole and Cajun are two cultures that originated in the French Catholic Colonies in New Orleans, Louisiana in the early 1700's. Since both cultures are French and share influences, one might wonder what the difference is between them and their cuisines. Cajuns, otherwise known as Acadians, are French colonists who settled in Canada. The British Conquest later forced them to settle in Louisiana. Some dispersed to the swampier region of Louisiana, which they named Acadiana. This area consisted of four regions: levees and bayous, prairies, swamplands, and coastal marshes. Here, the cuisine developed due to what was available in this land—particularly what they could access in the Gulf of Mexico. Creoles, in contrast had more access to unique and foreign ingredients because of other cultures in the area. Creoles, the general population born in French Colonial Louisiana, are descendants of French and Spanish people and also have African, Italian, German, Caribbean, Native American, and Portuguese descent. Because of their multiple ethnicities and cuisines, the Creoles had more access to a wider variety of ingredients. For example, Creole jambalaya uses tomatoes, and Cajun jambalaya does not. Tomatoes are from South America and were brought to Europe from the Spanish conquistadors. Thus, it makes sense that the Creoles would have access to them and the Cajuns would not. Seasonings are a huge staple in Cajun and Creole cooking; it's what makes the two distinctively different and similar. Some of the main ingredients in both cuisines are onions, celery, bell pepper, garlic, paprika, thyme, parsley, and green onions. 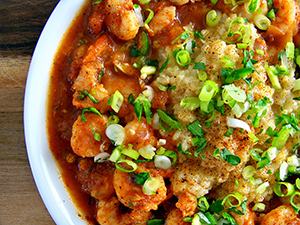 Ultimately, there is no airtight way to define either Creole or Cajun cuisine. Both are seeped in the history of food culture, born out of their home regions. Certainly, Creole and Cajun cuisine help make the melting pot of Louisiana what it is today.